33rpm LP Record featuring Kenneth Gilbert on harpsichord. It was issued on the Harmonia Mundi label in 1987. French pressing. Scarce. Faultless playback. 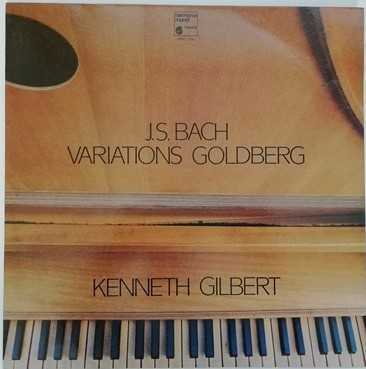 33rpm LP Record of HMC 1240 Bach GOLDBERG VARIATIONS featuring Kenneth Gilbert on harpsichord. It was issued on the Harmonia Mundi label in 1987. French pressing. Scarce. The record itself is graded excellent minus, with the main blemish being a scratch that covers the first three tracks on Side One. Play-tested on a USB turntable. Superb sound quality, with NO jumps, repetitive ticks, pops or crackle, despite the above mentioned scratch. Stunning faultless playback. The outer sleeve is graded excellent with no more than very light handling and storage wear. The spine is intact and strong with no loss to the lettering. The inner sleeve has no wear to speak of.